Media stands just provide maturity and real presence to your media room! It is the piece of furniture that is totally linked with entertainment and hence enhances the overall fun of the home! Media tables or stands come in different design and with custom storage features so one can purchase them according to his budget! 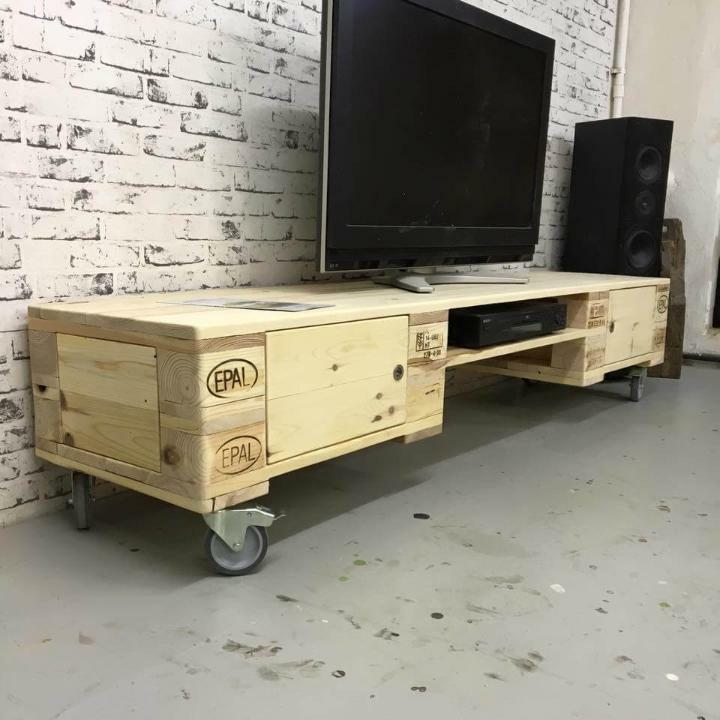 However, you can also design your own media stands at home using pallets which can also be as stylish as you want! 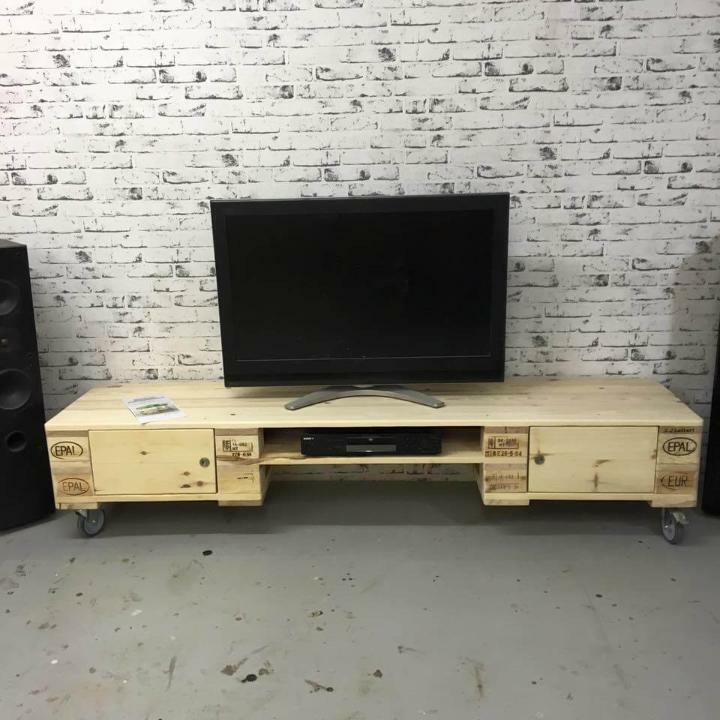 This pretty DIY pallet TV stand is a brilliant example we have selected to share with you to let you know some more creative pallet furniture ideas! This design is having extra large dimensions and two sub-cabinets installed to both ends! The mid section has been given amazing shelving levels to organize the media items like DVD players! This stand is a pure remake of EPAL pallet boards and latest hardware has been used for overall assembly! You can say this whole media table layout a creative remake or stacking of EPAL pallets! 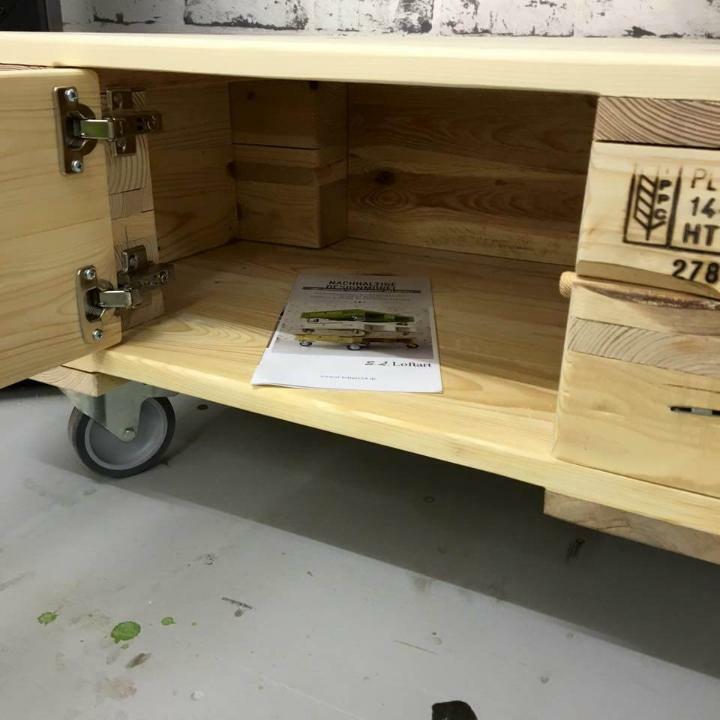 Pallet with EPAL tag are always sure that they are heat treated ones and would be safe for interior use! 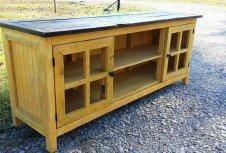 Get two extra large or long sizes of these pallets and get this low height media stand for free! Storage compartments or sub storage cabinets have been installed to both ends of the stand that can really secure well your media items! Latest inside door lock systems have been installed for a easy opening and closing! Center of this media stand contains a compact shelf that can perfectly hold a DVD player or compact CPU system! By stacking more pallets and by using more pallet wood, one can enlarge the number of shelves and storage compartments! 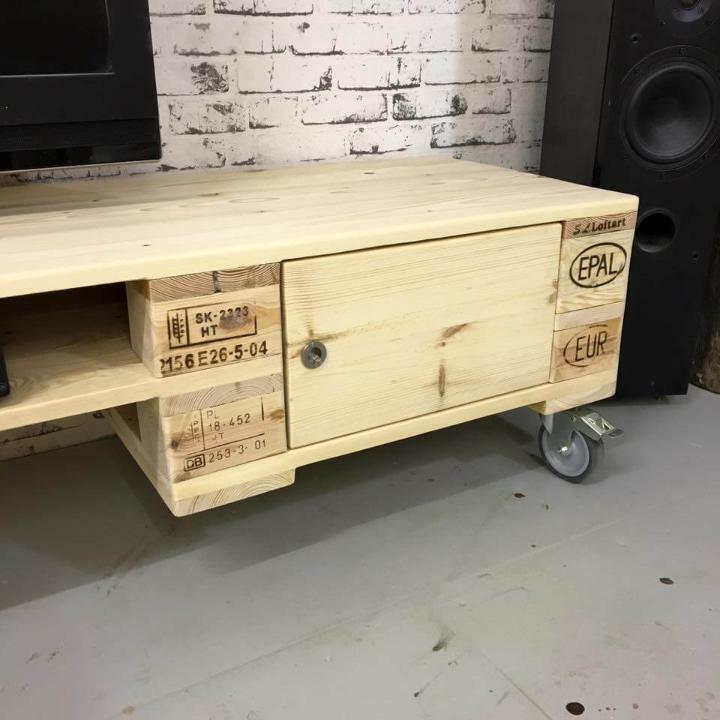 Hardware caster wheels just give super functional and industrial styled bottom to this pallet TV stand and also a make the stand touch-to-move! Paint and stain can be selected for a modern refined look and distressing techniques can also be used for a mid-century, vintage or shabby chic appearance of it!